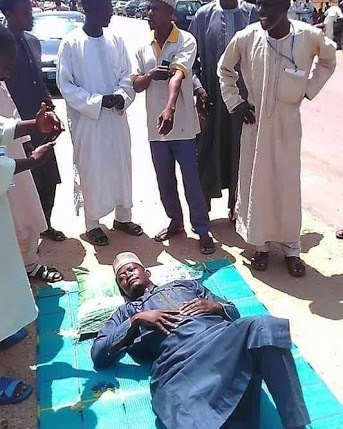 A man decided to show his displeasure with the current poverty and hardship being suffered by most Nigerians by laying on the road in a solo protest held yesterday in Zamfara state. It was gathered that the man refused the stand up as he gave one condition for him to do so, which is that the present Muhammadu Buhari-led government should be sacked. Just recently, a 28-year-old man, Nurudeen Lliyasu, climbed a telecommunication mast in Abuja, to protest the bad and incompetent leadership in the country. Mr Lliyasu said there was nothing working in the country, adding that the education, health system, infrastructure are all in bad shape, despite all the promises of change.